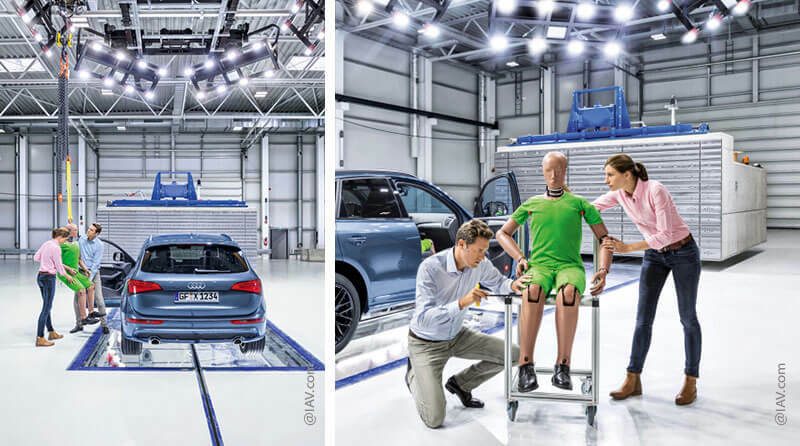 Thanks to the clever configuration and optimal integration of all the systems, several tests can be carried out at the new crash test facility in Ingolstadt on a daily basis. Superlatives, for instance in the form of the largest hall space, the longest track, and the fastest start-up speed, are no longer a representation of a test facility’s performance. These days, it’s more about supposedly soft criteria such as user friendliness, flexibility, and reliability, all of which are becoming more and more important around the world. A primary example of this trend is a cutting-edge test facility that MESSRING is currently building for IAV in Ingolstadt. A three-part hall structure with nearly 10,000 square meters of space, divided into a central crash hall and two unheated halls on the sides containing large sections of track and additional work spaces. A track measuring 200 meters in length for car-to-car tests and accommodating speeds up to 120 km/h. A central control station and a variety of separately positioned laboratories and rooms for vehicle preparation. For such a multifunctional and frequently used test facility, the arrangement and dimensions of the new IAV test facility are relatively straightforward. But it’s the inner values that make the new test center being built for the automotive engineers so special. The system technology makes it possible to carry out several different vehicle tests on a single track in one day and is by no means limited to standard tests, but can also accommodate more “exotic” tests such as rollovers. The heart of the facility developed by MESSRING is the 40-meter-long and 30-meter-wide column-free crash hall, which houses a majority of the technology. It’s designed for car-to-car tests and a variety of crash tests against a movable block. The points of impact and the desired impact speeds can be specified individually with little effort based on the test scenario. All of the key structures (e.g. MicroTrack system with film pit, drive and brake systems, fully automatic movable crash block) and all of the test-relevant components (e.g. data acquisition system, crash software, M=LIGHT LED lighting, camera technology) were configured in advance and optimally integrated by MESSRING, thus preventing friction loss as a result of erroneous communication between components, insufficient exploitation of the performance of individual components, or gaps in system interaction. The most important external characteristic of this integration is a control station that, compared with others, appears minimalist, but is said to set a benchmark in terms of ser-friendliness and efficiency. “The overall test facility is designed in such a way that it can easily be operated by a single person using a single monitor,” says Dierk Arp, CEO of essring. That saves time, conserves resources, and ultimately reduces costs.